For a country whose environment has borne the brunt of decades of war and has been sorely neglected by the erstwhile dictatorial regime, the us $1 million sanctioned by the authorities to bring about a revival seems to be a pittance. Ali Aziz Hanush, an advisor to Iraq's interim environment minister, feared that with massive reconstruction work in the pipeline, the amount budgeted might be enough to just pay the 700-odd ministry staff's salaries. He felt aid from the World Bank and the United Nations Environment Programme (unep) was required. 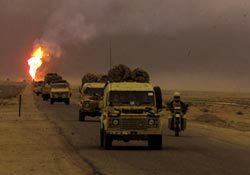 According to a unep report on Iraq, sources of pollution range from plain garbage to depleted uranium weapons used by the us-led forces which toppled Saddam Hussein. When the regime fell, thieves ransacked potentially hazardous materials from industrial and scientific facilities. Hanush, meanwhile, said his ministry was assembling a department of "ecological coordination", which would involve other ministries too.